Stately Traditional Design with Unique Curved Wrap Around Porch. 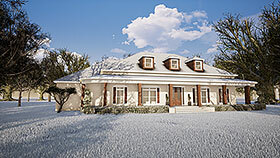 This stately traditional design has everything you need and want. The unique curved front porch will be a great conversation piece as it welcomes friends and family into your home. The large foyers leads to the office or to the hall and into the den. The den offers a cozy fireplace and open access to the spacious kitchen with the attached dining space perfect for entertaining. Continue enjoying family time visiting in the sun room or on the covered porch. Bedrooms 2 and 3 can be found on the right side of the home with a wonderful reading nook in between. On the opposite side of the home you'll find the luxurious master suite complete with a large walk-in closet that has direct access to the laundry room. Need even more space? the bonus room upstairs will make a great game room or home theater!